Are you ready for the 2015/16 tax yearend and beyond? 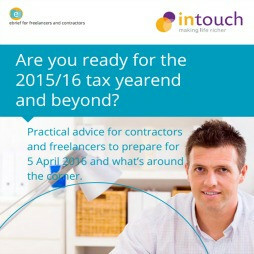 Practical advice for contractors and freelancers to prepare for 5 April 2016 and what’s around the corner. Are you ready for the end of the 2015/16 tax year? 5 April 2016 marks the end of the current tax year. The run up to this date is the perfect time to take stock of your personal income and Capital Gains and think about whether planning your overall tax liabilities for the current year will reduce your tax bill. It can be tough to keep on top of all the latest regulation and compliance so this guide has been prepared by specialist contractor accountants Intouch Accounting to help you make the most of your income in the run up to the 2015/16 yearend. It will help you consider introducing strategies to minimise your tax for both the current year and also throughout 2016/17. It may even trigger your need to consider entirely new alternative ways to provide your services. If you’re an Intouch client your Personal Accountant will help you with all of this as part of your all inclusive monthly fee. If you’re not already with Intouch, now’s a great time to join over 2,000 contractors benefiting from our expertise. Unlimited advice, everything you need throughout the year to run your company efficiently and effectively… all for a fixed monthly fee. Currently under an Umbrella? Considering contracting under one? 6 April 2016 is a game changing day for many Umbrella workers. You will lose tax relief on most of your expenses, mileage, travelling and subsistence costs. This will significantly affect your net take home pay. If you claim any expenses, everything will likely change for you. Some Umbrellas are switching their services to Limited Company, whilst others will be introducing untested alternative solutions that are likely to be scrutinised by HMRC. Whatever you are offered be cautious. Choose the service you feel most comfortable with and above all understand the implications (and what you’ll get for the fee they charge you). If you are not sure explore what is available in the market from other providers. If you’re currently working under an Umbrella then now is the time to discover the benefits of being Limited. It’s a wise choice for knowledge-based professionals earning well above the National Minimum Wage and for whom contracting is a long-term career option. The tax efficiencies that can be achieved are well worth exploring and you can enjoy the freedom to earn how you want to. If you’re not sure which trading model is best for you download our popular guide: Limited Company, Umbrella or Sole Trader – which is the right choice for you? Our free take home calculator will quickly help you see if you’d better off being Limited. Already have a Limited Company? If you already have your own Limited Company and are looking to switch accountants we can help you move to Intouch and get you off to the best start for 2016/17. Contact us today to find out how. New dividend tax From 6 April 2016 dividends will be taxed differently. The need to gross up a dividend has been withdrawn, this means the amount you receive is the amount that you will be taxed on. Your dividends will instead be subject to a new dividend tax. The first £5,000 of dividends are taxed at a nil rate, and are therefore tax free. Subsequent dividends will be taxed at 7.5% where they are within the basic rate tax band, 32.5% for those in the higher rate band and 38.1% for those in the additional rate band. The new rules will increase the amount of tax payable above the nil rate compared with 2015/16 but there are opportunities to mitigate this. If you’re not sure what your dividend policy should be Intouch offers a personal assessment to identify whether opportunities exists for you. We offer services for clients and non-clients so please contact us for more information and a fixed price. Talk to your accountant about the preventive measures before 6 April 2016 and what you can do next year to minimise the effect. It’s all change on the expenses front. Umbrella workers are losing most of their tax relief on expenses, mileage claims, travel and subsistence because of the salary sacrifice and supervision, direction or control tests being introduced on 6 April 2016. The only Limited Company contractors affected are those subject to IR35. They will lose their mileage, travel and subsistence expenses. Replacement of all dispensation with a general reporting exemption. The Employment Allowance is a deduction of up to £2,000 from the employer’s National Insurance (NI) payable by your company. If you are subject to IR35 the allowance is not available against any deemed payment, therefore ensure your normal salary is sufficient to use up the allowance. From 6 April 2016 the value increases to £3,000 but is no longer available if you are the director and sole employee. Talk to your adviser about your options, especially if your partner or spouse helps you administer the company. Your adviser can help you set salary levels at the acceptable levels to maximise the available allowance. As you prepare for the tax yearend there’s a lot to consider but it is worth investing the time so you reap the maximum benefits in the long run. A reputable contractor accountant should be able to work with you on this and help you operate in the most tax efficient way. Our expert accountants at Intouch can help you make sense of it – after all, they do this all the time, so it’s worth giving us a call 01202 901 385. As the clock strikes midnight on 5 April 2016, here is a selection of the more common considerations you should have made. But this checklist is no substitute for reading this guide in full and discussing your circumstances with your accountant. You should be able to estimate your total taxable income to 5 April 2016. Work out what your gross (before tax) income will be from your company and then add any other gross income you know will be received. Using last year’s tax return is often useful as a guide, making amendments for any changes known to have occurred in the current year. Once you have estimated your gross income deduct the tax allowances that you know you are entitled to. These are usually reflected in the tax code used for calculating the tax on your salary. Once allowances are deducted you will have an idea of your taxable income. Repeat this process for your spouse. If you are a contractor operating through your own Limited Company you have a great deal of control over the amount and timing of the money you take from the company; and, if you are not subject to IR35, how that money is taken (salary, dividends, loans or benefits). This means that in most cases you can manage whether or not you make the most of the basic rate tax band. Those working under an Umbrella don’t enjoy the same freedoms as Limited Company contractors when it comes to managing salary as they are paid by the Umbrella, based on timesheets and expenses with deductions made for PAYE, NI and the monthly fee payable to the Umbrella. Having estimated your taxable income, compare this with the basic rate threshold – for 2015/16 this is £31,785. If the taxable income is less than the threshold consider declaring a further dividend equal to 90% of the difference. If you don’t need the money now that doesn’t matter; in the long run making maximum use of the tax band may reduce amounts you need to take in the future when tax maybe at a higher rate. If your spouse is also a shareholder then repeat the calculations. When deciding on whether or not to take an additional dividend always consider who the shareholders of the company are, and whether declaring a dividend would affect those shareholders. If declaring a dividend means another shareholder will suffer higher rates of tax then think carefully before proceeding. And, of course, there should be sufficient profit after tax to declare the dividend in the first place. Have you considered whether the tax code used in calculating the tax on your salary is accurate? If your tax code is out of date this could mean that any PAYE deducted from your salary (if any) is incorrect, and lead to an unexpected tax underpayment (or even overpayment). You may have recently submitted your SelfAssessment Tax Return (SATR) to 5 April 2015. If you were expected to pay additional tax you may also have been expected to pay Payments on Account for 2015/16. If your estimated taxable income for the current year 2015/16 is likely to be less than 2014/15 it’s worth considering asking for the Payment on Account to be reduced to reflect your actual expected income. You can check whether you currently owe any taxes, or are due a refund, online via the HMRC Gateway. It’s worth checking the current balance, although this will only be accurate to 5 April 2015. If you are due a refund don’t wait for HMRC to pay you. It’s always worth chasing for your money, and if you owe HMRC anything you will need to consider how to meet this cost and whether or not you need additional income to make those payments. If you are liable to make student loan repayments, and these are not deducted from any salary at source then you will need to consider the value of any repayments based on your overall income levels. The deductions are calculated at 9% of your income above £17,335 (this is increasing to £17,495 from 6 April 2016) for loans taken before 1 September 2012. For later loans it’s 9% of income above £21,000. For student loan purposes ‘income’ means UK taxable income excluding the value of Benefits in Kind but does include both UK and foreign income, property income, interest and dividends. If you are not sure what repayments are due or have been paid contact the Student Loan Company for a statement of account. This section of the guide is particularly relevant for those who already have a Limited Company or are seriously contemplating making the move to maximising their income. The tax savings you can enjoy through your own Limited Company mean you can get more from your business and maximise your take home pay. Operating under an Umbrella significantly reduces the freedoms you have in how you earn and how much. Generally, if you are expecting to contract for more than nine months and expect to earn more than £30,000 then setting up a Limited Company will be the most tax efficient option for you. From 6 April 2016 these rule of thumb guides will change and become more attractive at lower income levels. As a contractor working through your Limited Company it’s worth carefully thinking about your working practices for each contract that existed during the tax year. We recommend that you look at your contract each time it is renewed and for longer term contracts at least every year. Although you have until 31 January 2017 to make a final decision on whether IR35 applies for the tax year 2015/2016 or not you will pay interest on late payments of tax and NI that are normally due by 22 April 2016. From 6 April 2016 your status will become more important as the new restrictions of travel and subsistence take hold. If you consider yourself at any risk that IR35 could apply consider obtaining a review of the relevant contract and working practices. As an Intouch Accounting client we offer IR35 risk assessments for any new contract you undertake as part of your all inclusive monthly fee. If you’re not a client, we can still review your contract for a fee. If you are owed money from your company it may be better to take a repayment from the company rather than dividends that are taxable at higher rates of income tax. But, for 2015/2016, the new dividend tax rules (above) means that you should consider this carefully. If you have borrowed more than £10,000 from the company as an interest free loan you will be liable for a taxable benefit on the interest-free element. If you intend to repay the loan before 5 April 2016 then it’s worth leaving a small amount outstanding to the company because the standard method used by HMRC to calculate the beneficial interest can produce a lower taxable benefit. Make sure you don’t get caught out by expenses that are taxable Benefits in Kind when you don’t expect it. Mobile telephones owned personally, home telephone bills paid that include private calls and broadband packages that include entertainment and home telephone can become taxable. If you are one of the few contractors that has a company car, van or motorcycle you should check the cost of the taxable benefit. It’s very difficult to assess whether vehicles should be owned personally or by the company and often circumstances change over time. The comparison should be completed at least every year and then any change reported to HMRC (there is a quarterly reporting process for company cars so you can complete a comparison at any time during the year to make the most of your circumstances as they change). It’s also important to check that you have claimed all the business expenses that you paid personally, including your business mileage, use of home as office, any subsistence or professional subscriptions. The repayment of these costs is tax free to you, but equally important is the 20% tax relief the company will obtain on reducing its profits. There are some costs that the company can incur that convey a personal benefit but are not taxable. One of the most obvious is child care vouchers. You may also want to consider if now is the time for medical check-ups and eye tests that should be invoiced to and paid by the company. The new trivial benefit rules offer an opportunity for the company to provide benefits without incurring tax, although you should obtain the basic rules from your accountant to avoid falling into the various traps accompanying the new rules. Personal contributions to pension schemes attract income tax relief at your highest rate of tax. For a pension contribution to reduce your 2015/16 income you must pay on or before 5 April 2016. Tax relief is limited to the greater of a gross amount of £3,600 and the amount of your UK relevant earnings, but subject to the overall annual personal pension allowance cap of £40,000. If you haven’t used all your tax reliefs for the last three tax years then you can carry these forward to the current year in the right circumstances. Equally, if you don’t use all of the current years’ relief, then unused reliefs can also be carried forward. If you haven’t already, appoint an IFA to review your position before 5 April 2016 to gain a clear understanding of what you can do now and what will be available in the future. If you are married then you should have already considered whether or not your spouse should own shares in your company. If you have recently come to the UK or have left, or plan to leave, the UK, your tax residency in the UK can have a significant effect on the UK taxes that you pay – both Income Tax and Capital Gains. Similarly if you are not a UK resident then it’s worth considering how your overseas income is taxed. Residency and domicile are complex areas of tax. If you consider you are affected then you must seek personal advice from your accountant on any decisions to take before 6 April 2016. If you have a child for whom Child Benefit is received (even if it’s not you that receives the payments) you should consider the level of your income and whether you will be liable to a tax charge to recoup the Child Benefit payments. If your income exceeds £50,000 the Child Benefit tax charge will be proportionately calculated at the rate of 1% of the Child Benefit paid, per £100 earned above £50,000 and where income is £60,000 or above the full amount of Child Benefit paid is recouped as a tax charge. If you can move income from one spouse to another and keep both spouses beneath the £50,000 limit then no tax charge will arise. Consider whether it is worthwhile delaying income, if by doing so your income will fall below £100,000, in order to preserve personal allowances. Personal allowances are restricted once personal income exceeds £100,000, the restriction being equal to 50% of the excess over £100,000. If you can move income from one spouse to another and keep both beneath £100,000 then the personal allowances for both spouses can be preserved. When you make a personal charitable donation through Gift Aid the charity reclaims an amount equivalent to the basic rate. Basic rate tax deduction is therefore given at source when you make the donation. Higher rate or additional rate UK taxpayers can also obtain further tax relief and you should maintain a record of all Gift Aid donations. If you are married then also consider how income producing assets and investments are owned. Typically income held jointly is taxed equally but you can change that split if it’s beneficial. Similarly if you own income producing assets and the income is taxed at higher rates maybe you should consider transferring them to your spouse if your spouse pays a lower rate of income tax. There are numerous rules to consider so always take advice before transferring ownership if electing alters the split of jointly owned assets. If you have sold assets or investments and have realised a gain you may be subject to Capital Gains Tax (CGT). You are entitled to a tax exemption for the first £11,100 of CG without paying any CGT. If you don’t make use of the exemption you will lose it permanently as unused amounts can’t be carried forward. If you are thinking of selling an asset or investment and will realise a gain it may be worth selling before 5 April 2016 or, if the gain is greater than £11,100, splitting the sale to use this year’s allowance and the allowance for next year. If you have gains above the exemption that are taxable but also own assets or investments that have fallen in value, you may want to consider selling those assets before 6 April 2016 to realise the loss and reduce the tax on your other gains. If you are considering winding up your company you could take advantage of unused CGT allowance and use Entrepreneur’s Relief (ER) to only pay 10% CGT on the excess over the allowance when paying out a final distribution of the surplus cash from your company. Careful planning is appropriate to avoid a number of obvious pitfalls and where the amounts are greater than £25,000 you would need to voluntarily liquidate your company. New rules have been proposed that are expected to become effective on 6 April 2016. By the time new rules are known there will be no time for any voluntary liquidation and where you are caught by the new rules, you will lose the ER and pay tax as though distributions are dividends. The rules relating to main residence CGT exemption have changed for 2015/16 and are also subject to further modification from April 2016. There are tax favoured investment opportunities available that can reduce your tax liability or offer favourable tax treatments. When considering any such arrangement remember that first and foremost these are tax incentives to invest in high risk business opportunities. You will risk losing your money. You must take professional advice from an IFA before embarking on any such investment. Individual Savings Account (ISA), Junior ISAs and New Individual Savings Account (NISA’s) offer opportunities to obtain tax-free income and gains. ISAs are an excellent investment for higher rate taxpayers and the maximum allowance for 2015/16 is £15,240. From 2015/2016, the income tax exemptions on ISAs will be preserved on death, where one spouse or civil partner leaves it to the other. They remain chargeable to Inheritance Tax (IHT) however. VCTs are specialist investments that enable you to invest indirectly in a range of small higher risk trading companies and securities. VCTs are companies in their own right and are listed on the Stock Exchange. Under the EIS, your tax liability for the year may be reduced by up to 30% of the sum invested (up to a maximum of £1m invested in the year). In addition, Capital Gains from disposals in the previous 36 months or following 12 months may be reinvested into EIS shares, resulting in a deferral of the gain. This can be useful to defer a gain on winding up your company or on other gains you may have made or plan to make next year. The SEIS scheme offers another form of reinvestment relief for investors who subscribe for shares in small start-up companies. For 2015/16, the maximum qualifying investment is £100,000. Income tax relief is given at the rate of 50% of the sum invested, and relief may be given against tax both in 2015/16 and 2016/17. Both EIS and SEIS shares are normally exempt from CGT and IHT although complex qualifying conditions must be met. It’s never too early to consider your Inheritance Tax (IHT) position. Make sure that you have considered drawing up a Will or reviewing an old Will. There are considerable tax pitfalls that can be avoided from a properly constructed Will. The IHT nil rate band is currently frozen at £325,000 until 5 April 2018. As part of any IHT planning you should at the very least consider making full use of the available exemptions. An amount of up to £3,000 can be given away each tax year and, if unused in a year, that amount can be carried forward for one year and utilised in that later year. You can give up to £250 to as many people as you wish each tax year. If your income regularly exceeds your expenditure, you can give away some of the excess. The gifts must represent a pattern of giving or there must be evidence of the intention to make these gifts regularly and the gift must not result in a reduced standard of living for you. You can also consider making lifetime gifts in excess of the above exemptions. You must survive such a gift by seven years for it to fall out of your estates entirely, and you must not continue to benefit from the assets once they are gifted. The gifts might be absolute gifts to family members, or they could be gifts into trust. Gifts into trust can give rise to an immediate charge of IHT at the rate of 20% and therefore generally transfers to trust should be limited to the available nil rate band. Trusts can be very beneficial, but specialist advice is needed. IHT efficient investments, for example, shares in qualifying AIM listed companies, benefit from business property relief and as such are relieved from IHT after they have been owned for two years. Make sure you’re prepared for 5 April and beyond so that you get the best and the most out of contracting.